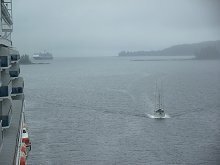 Thursday, June 24: This was the view from my cabin at 06:50 this morning, a couple of hours north of Ketchikan. 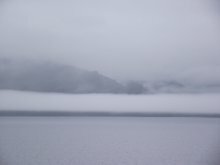 This was certainly not the weather I wanted to see on a day that I had a flightseeing tour of Misty Fiords National Monument booked, but it was ragged enough that the potential for the clouds to break up was there. 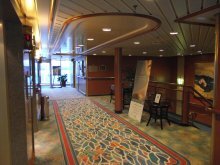 On Deck 14, looking towards the entrance to the Lotus Spa and the gym. 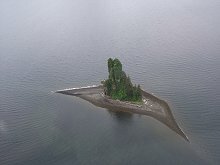 Just south of the Guard Islands in Tongass Narrows at 08:30. 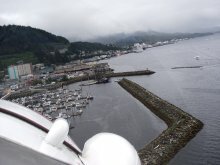 This bald eagle had one of the better perches overlooking Ketchikan's harbour. 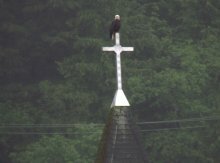 The church steeple is actually a common place to see an eagle. 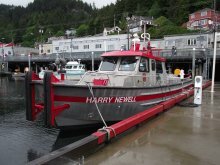 The Ketchikan Fire Department's fireboat Harry Newell. It was named after firefighter Harry V. Newell, who died in the line of duty on April 7, 1955, at the age of 56. 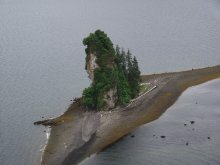 The working end of the seiner "Lake Bay". This looks like an excellent candidate for a proper restoration project - it appears to be all original. 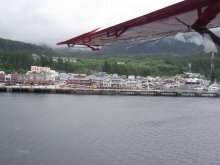 I walked over to Island Wings to see if any seats were still available for the 28th if today's flight was cancelled, but the attendant was confident that we'd fly today so I went back to the ship for a pizza lunch. My timing to get back on deck was good, as I got a few shots of owner/pilot Michelle Masden and the attendant launching "1-7-Foxtrot". In a couple of hours I'd be doing exactly that! At 2:18, off we go! I volunteered to take the back seat, so I could shoot out both sides of the plane (only 1 person sits back there). 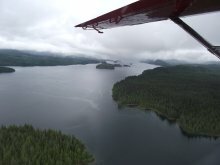 Just below what looks like a solid cloud layer - but there were lots of holes straight ahead. 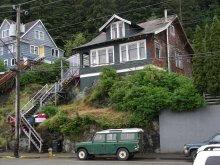 A look at the outskirts of Ketchikan before heading off into the wilderness. 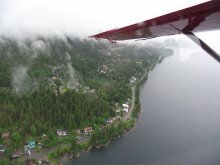 We each had high-quality noise-cancelling headphones, and for a few minutes until we got out of Ketchikan's controlled airspace, listened to music and Michelle's communications with the tower. Once we were out in the backcountry, Michelle had lots to say about the country. 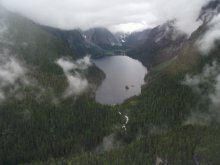 Most of the aerial photos in the excellent new book "Salmon in the Trees: Life in Alaska's Tongass Rain Forest" were shot from Michelle's plane. 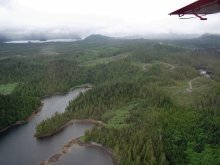 Michelle is particularly knowledgeable about the forests and how logging practices affect them (beyond the obvious). These cut blocks have been logged at various times over the past 40 years or so. 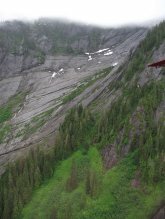 Eddystone Rock, a dramatic volcanic plug in the middle of Behm Channel, which arcs through Misty Fjords National Monument. The further in you go, the more spectacular the fjords get. 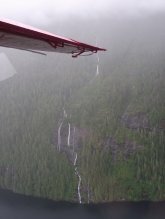 There are waterfalls everywhere! 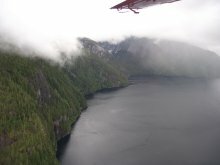 We'd be landing on this postcard-perfect lake in a few minutes. 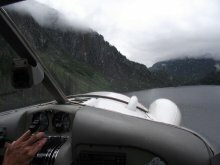 The approach to the lake landing. 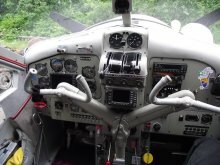 Having a fair bit of experience in flying my own plane in the coastal mountains, I'm very fussy about who I fly with and what I fly in. Michelle is simply a superb pilot, in charge of a magnificent aircraft. Michelle helps her "co-pilot" onto the beach. The other passengers were 3 generations of a family from Toronto, and we spent a very pleasant 40 minutes or so surrounded by some of the most magnificent country on earth. 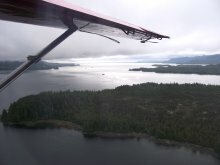 A couple of Turbo Otters landed, but their stops were very different that ours. 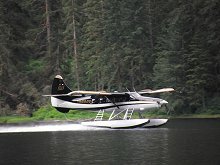 The passengers got out on the floats for perhaps 5 minutes, then back in the plane and they were gone. 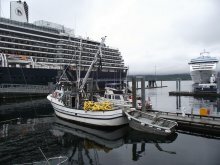 That's a perfect exmaple of why I virtually always book my shore excursions independently rather than through the ships. For the flight back, I got the front seat. Michelle says that "the boys" call this a "chick plane". 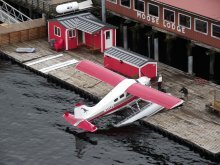 This is what half a milliion dollars will get you - every comfort and convenience feature you can think of, from leather seats to iPod system, cargo upgrades and fish-spotting equipment. 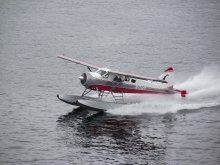 The folks at deHavilland who built this bird in 1959 would be impressed! Off we go at 3:45, through another rain shower. A closer look at Eddystone Rock - 2 bald eagles could clearly be seen in a nest right at the top of it. 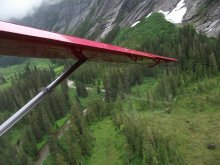 Another pilot had told Michelle where a black bear could be seen. We found him, and Michelle made a couple of tight circles so everyone could have a good look. A couple of minutes later I spotted another and we made another couple of circles. They may be little dots but I love seeing them anyway - just knowing that they're there is all I need. 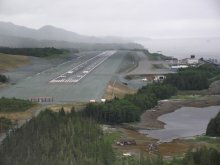 A good look at Ketchikan airport - Michelle took this route to we could see Sarah Palin's "highway to nowhere" and another bald eagle nest. I went for a late dinner tonight (the lamb was "nothing to write home about"), and even went to the late show in the theatre, which was very good (but I nodded off a few times anyway - it'd been a tough day! ).